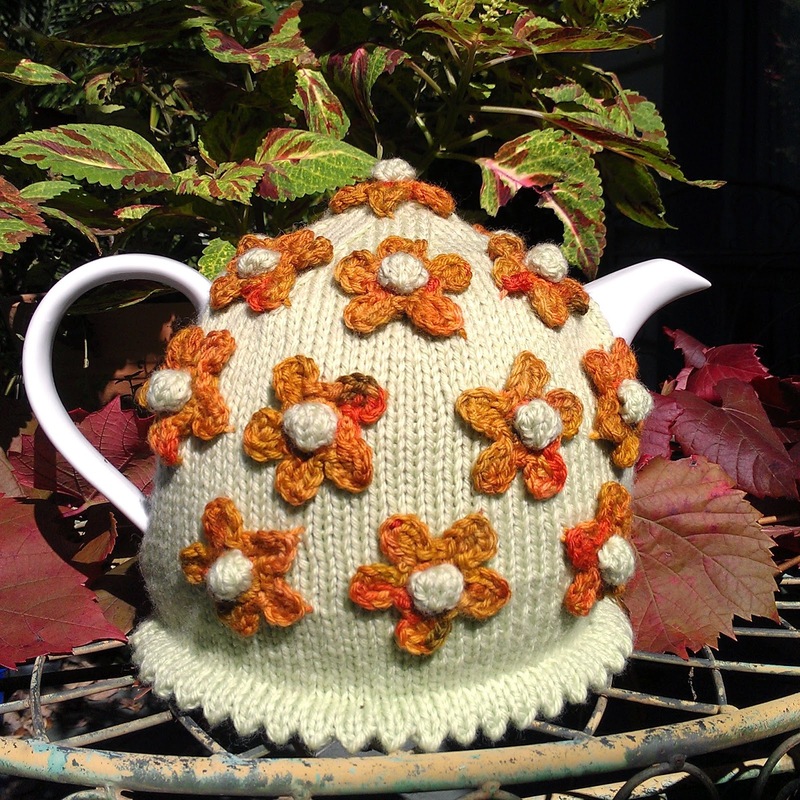 This is one of those double layer cosies that keep the teapot seriously warm. The finished size of this cosy is 20cm high and 20cm wide; it fits a fairly large pot; my pot holds 7 cups of tea (1.75 litres). With the 3.5mm crochet hook, work a 6 chain ring. 1 chain, 14 double crochet into the ring, join with a slip stitch to the first double crochet. 1 chain, into first dc, work *1dc, 1htr, 1tr, 1htr, 1dc*. Miss 1 dc, work *1dc, 1htr, 1tr, 1htr, 1dc* into next and every second dc, forming 7 petals. Finish with a slip stitch into the first dc. Cut off yarn, leaving enough thread to stitch the flower to the knitted work; pull one of the knitted bobbles through the centre of the flower, and stitch in place. For the outer layer of the cosy, cast on 44 stitches with the 4mm needles. Work 3 rows of stocking stitch, starting with a knit row. 4th row *Yarn forward, K2 tog*, all along the row. 5th row Work 4 rows of stocking stitch, starting with a knit row. 6th row Fold the work in half with the right sides to the outside; knit together the first stitch on the needle and the loop of the first cast on stitch. Continue along the row, thus making the hem. You should still have 44 stitches. Continue in stocking stitch for 13 more rows. 20th row *Knit 10, bobble in the next stitch*, all along the row, finish with K11. Work 13 rows of stocking stitch. To make a bobble, knit into the front and back of the same stitch twice, and into the front again. Turn. Work 4 rows of stocking stitch on these 5 stitches, then slip the 2nd 3rd 4th and 5th stitches over the 1st stitch. 11th and each alternate row, purl. Work the second side of the tea cosy the same, except for the bobble on the 28th row*. Omit the bobble and work K1 instead. Stitch the 2 pieces together across the top for 7.5 cm each side of the centre. Make the flowers, and pull the bobble through the centre of each flower; stitch in place. The flower petals can be left free, or stitch them down to give a different effect. This is worked in one piece, beginning at the centre top. Using 8ply yarn and a set of 4x4mm needles, cast on 8 stitches. Divide these on to 3 needles; and using the 4th needle, knit one round. Continue increasing 8 stitches in every second row until there are 88 stitches. Knit across until there are 44 stitches on one needle. Divide the remaining 44 stitches onto 2 needles, and leave till later. Working on the first 44 stitches, using 2 needles, work 36 rows of K1P1 rib. Join yarn in to the remaining 44 stitches, and work to match the first side. With the wrong sides together, join the outer and inner layers at the centre top. Slip stitch the cast off edge of the linings to the top edge of the hem on the outer layer. Slip stitch the lining to the outer layer all around the openings for the handle and spout. 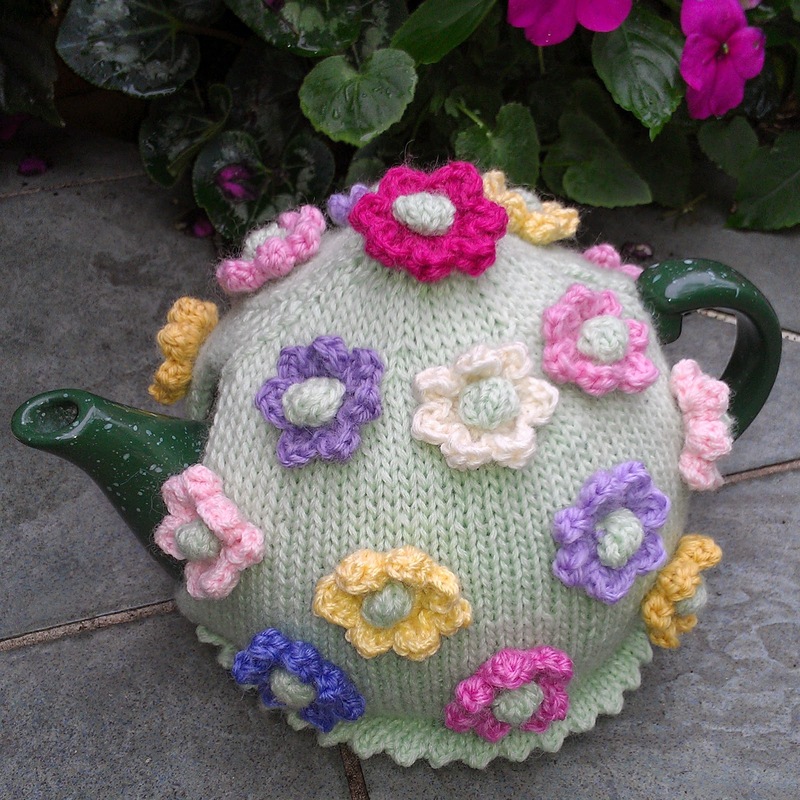 Join the lower edges together for approximately 4cm, or to suit the teapot. Make 6 chain, and join together to form a ring. Work 1 ch, 10 dc into the ring, ss into 1st dc. 3 chain, 1 tr into same space as the ss, 3 chain, ss into the same space as tr. (Ss into next dc; into next dc, work 1ss, 3ch, 1tr, 3ch, 1ss.) Repeat, to form 5 petals; finish with a ss into the next dc.